Documentary-style photography captures a momentary glimpse of reality, allowed to stand on its own needless of captions or explanations. Photographer Johnny Miller has devoted his time to capturing shadows of past separation – apartheid in South Africa – that’s otherwise invisible from the ground level. Originally from Mukilteo, WA, his love of photography began when he picked up his first still camera seven years ago. “Considerations of how to rectify inequality occupy us daily. It’s entrenched in our systems of economy, society and government to some extent. In South Africa’s case, also in our architecture,” he said. Just as he had begun his career in photography in 2011, he won a Rotary Ambassadorial Scholarship, allowing him to study anthropology at the University of Cape Town. His coursework involved spatial planning – frameworks designed to articulate coherent and sustainable developments within a city; and architecture, especially structures built during times of segregation. Drone photography allows Miller to observe the world from his specific angle, enhancing his views and exploring it like no other. It pulls back veils inaccessible from the ground. 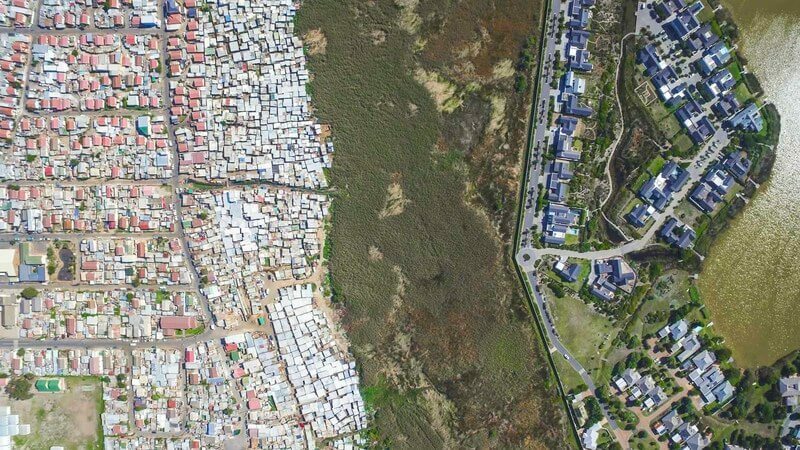 Using his Inspire 1, he contrasts South Africa’s urbanization with its under-developed regions constructed during apartheid. Apartheid or “apartness” in Afrikaans was a slogan under then ruling party, the National Party, deprived non-white South Africans of human and civil rights, forcing them to live in poverty-stricken segregated areas. Consistent pressure from the international community and civil unrest ultimately led President F. W. de Klerk to open negotiations with political activist Nelson Mandela, who spent 27 years in prison for his leading opposition against the government before becoming South Africa’s first black president, changing face to South African politics. Today, though apartheid ended 22 years ago after being in force for nearly half a century, the differences remain stark – if you’re able to view them. From a social point of view, South Africans or someone like himself, who has lived there for five years, identifies with these issues. Outsiders, though, are either unaware or unconnected to them. His images shed light on the decades of conflict and separation. 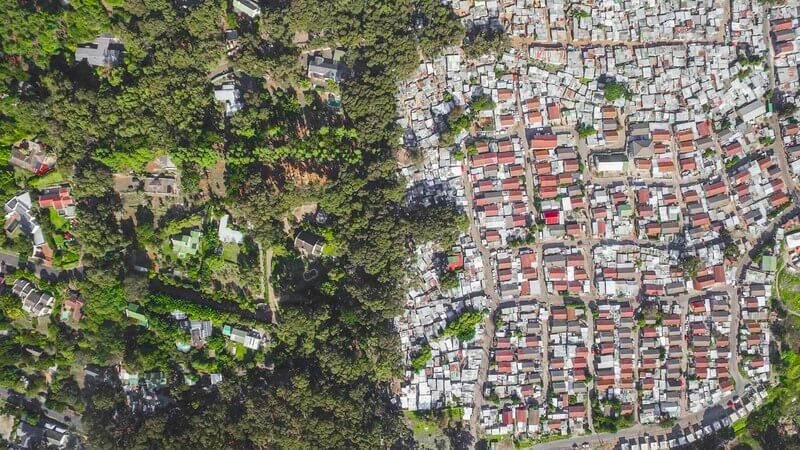 In fact, when you see some of his aerial shots of packed, slum-like settlements abutting more-affluent white areas, the grass truly is greener on the other side. “When I moved to South Africa, inequality was impossible to ignore. 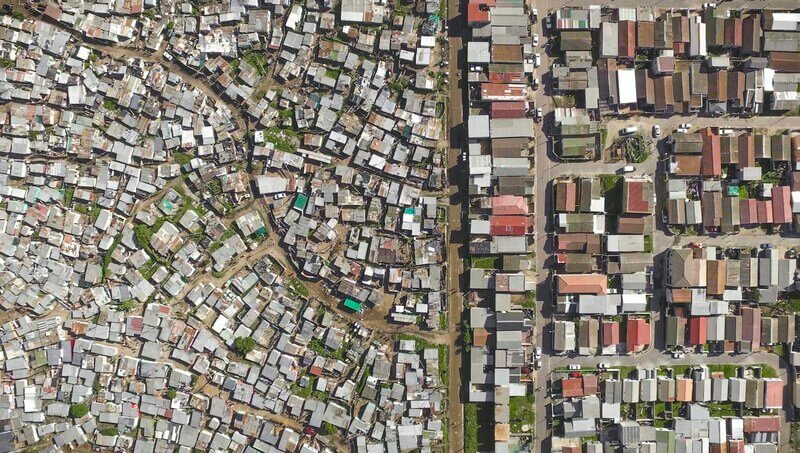 From the minute you land in Cape Town, you are surrounded by tin shacks…disease, crime, unemployment and anger. However, a minute’s drive will bring you to a door where there are all pleasures of life. Internet, cars, comfort, swimming pools, access to wealth and most importantly, hope,” he said. As a photographer, the first thing Miller looks for is strong and unique composition. His drone offers a view from the sky most people never see, shifting offering those who see the shots a new outlook. At the same time, besides stark contrast, his photos reveal beauty on the ground from above. That’s often what he strives to capture, even in documentary photography. He starts off by using a map of South Africa created with census data. The government website allows him to search areas based on income, language, and race - each labeled in different colors. Using this map, he easily sees the discrepancies in the economy and the layout of each city he wishes to fly over. Once he has identified some target areas, he captures his frames in real time. His favorite photo is one called, “Sweet Home/Vukuenzele,” in which it was compelling to see organic structures of informal and formal settlements meeting between rigid lines. “I am constantly surprised at what I find flying. Just last week, while I was in Durban collecting images, I found an informal settlement that exists literally within a golf course. The golf course is named after an apartheid-era golfing icon who died penniless after being stripped of his right to compete by the government. The irony is incredible,” Miller said. His iPhone, he added, is the most indispensable part of his gear, allowing him to multitask and save data when needs be. He picks apart sharpness and contrast, spending a great deal of time looking at his images magnified. “I bought my Inspire 1 drone in Seattle in February 2016. It is an absolutely fantastic piece of machinery. Everything is easy to use, and very well made,” he said. He especially thinks the DJI GO app is well designed. “I crashed the drone once, and broke the gimbal, which also destroyed the SD card, losing all footage for that flight. Luckily, the phone itself stores up to 2GB of proxy video files, so I could actually go back and review my flight. If I really wanted to, I could even show a client those proxy files, because at least on mobile, they are often good enough,” he said. The Inspire uses DJI’s Lightbridge technology for video downlink, buffering a 720p version of the video shot by the drone onto the user’s smartphone or tablet. With each landscape delving into a different photographic experience, Miller said he hopes to see more of Africa and venture out to as many countries as he possibly can.